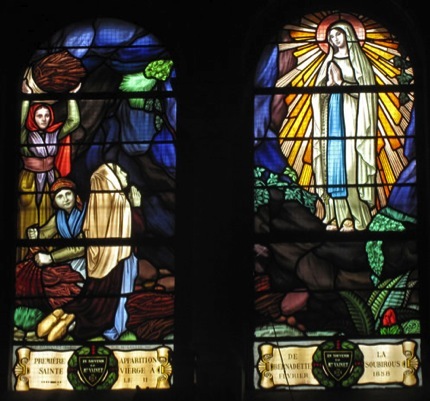 “My beloved children, today, when you contemplate the ANNIVERSARY OF MY FIRST APPARITION TO MY LITTLE DAUGHTER BERNADETTE, IN LOURDES, I invite ye again to look at Me as the Immaculate Conception who appeared atop the Rock of Massabielle, more terrible than a Army in Order of Battle, shining like the Sun, crowned with stars to crush all the evil of the world and to bring the Lord’s Peace to each one of ye! I appeared in Lourdes, terrible like an Army in Order of Battle, to fight against the Satanic forces who by means of the rising communism and of other things, was already starting to rehearse his steps to spread hell’s poison in the world and in souls and make Satan already at the outset of the beginning of his great activity on Earth, already broken by Myself and crushed with My Apparitions in Lourdes, though which caused faith to survive and win not only in France and Europe, but in the whole world throughout the twentieth century which was marked by My adversary’s very intense activity. This way, already at the start of Satan’s time, I came down from Heaven powerful and appeared to My little daughter Bernadette, to through Her rip the world’s darkness, make the Sun of grace shine and give all of humanity the certainty that in the end, I, the IMMACULATE CONCEPTION, purity itself, holiness itself, the one who was never under the slavery of original sin, nor of Satan. I Am already a winner and in the end, all those who will be on My side with Me will triumph over sin, violence and all the evil that there is in the world. I appeared in Lourdes, terrible like an Army in Order of Battle, to gather My children around My Immaculate Heart, to fight with Me for the salvation of so many souls who run the risk of condemning themselves eternally. I made of My little daughter Bernadette the first among My soldiers, She who with the weapons of prayer, of love, of abnegation, of the forgetting of herself, of sacrifice, of the total donation, fought arduously with Me and even stuck to a bed of pain after the Apparitions, was a valorous warrior, who conquered millions and millions of souls for Me and also conquered for the Shrine of Lourdes a grace: a mystical, supernatural and holy atmosphere, that endures until today, touching so many hearts and attracting them to Me. This way, all of ye also, by the example of Bernadette, can be My soldiers and help Me in the great work of salvation of humanity, offering Me not only your prayers, but also your abnegation, the forgetting of yeselves, sacrifice, penance in the sufferings of life,so that offering Me these mystical roses: white of Prayer, red of Sacrifice, yellow of Penance and Expiation, you can help Me to save so many souls that My enemy now intends to lead to sin and then drag with him to the eternal flames. Be My valorous warriors, My fighters who at every moment fight with Me for the salvation and the conversion of the whole world. I appeared in Lourdes, terrible like an Army in Order of Battle, to show ye that My times have come, the times of the Woman clothed with the Sun, of the great fight between Me and the great infernal dragon that I also prophesized in LA SALETTE the SECRET that I gave to My little daughter MELANIE. These times in which you live are marked by the struggle between the Angels of the Lord and the Angels of hell, the evil Angels, between Lucifer and God, between the serpent and I, the Woman clothed with the Sun. If ye My children, fight with Me with the weapons that I gave ye, if you use wisdom and intelligence and don’t waste time, we will truly be able to make My enemy retreat, return all the souls that he seduced to sin again to the fold of My Son Jesus, re-conquer the ground he gained and this way give again to My Son the souls that He redeemed with the price of His blood shed on the Cross and thus secure for the Lord, for yeselves and for Me, the final victory. Fight! I did not call ye to accommodate ye and to wait for God to do everything for ye! I called ye to be My soldiers, My warriors, be truly members of the Church Militant, of the one that fights on Earth against all the forces of evil and that hopes in God the day of His glorious return. If ye would be the true militates of My Celestial Militia, fighting with My Angels and Saints, bringing My Messages everywhere, combating sin with energy and vigor, if ye forget yeselves and have the high ideals which I plated in the heart of little daughter BERNADETTE and that she welcomed with so much docility and generosity, the ideals of donating yourself for the salvation of the world, of donating your whole life to Me and to God, of having a more sublime, higher and more holy life, then, truly ye little by little will sanctify yourselves like Her, you will arrive at that interior purity, that love ablaze that She had in Her heart, that perfection consumed of all the virtues and one day you will be able to reunite yeselves to Her in the glory of Heaven to together praise the Lord, bless His Name and proclaim His glory forever and ever. I, the IMMACULATE CONCEPTION, WHO APPEARED IN LOURDES, come today again to tell ye: GO DRINK AT THE FOUNTAIN, WAS YESELVES IN IT. Go drink at the fountain of grace, of the Lord’s grace, which purifies ye of all sin, that frees ye of all evil, that cures ye of all spiritual sickness and that makes ye be truly free, truly pure and truly Holy for the greater glory of the Lord. Go drink at the fountain and wash yeselves in it, to take out of your souls all sin, all the stain of spiritual misery, so that truly all the disorganized attachment of yeselves, of the world and of creatures, finally, is extirpated from inside of ye so that then you can truly walk on the path of holiness, that My little daughter BERNADETTE, guided and taken by the Hand by Me, trod before ye, so that then the world, seeing your light, seeing the light of your soul and your holiness, also believes and thus God’s love triumphs on all hearts. I, your MOTHER, am with you every day of your life and will never abandon ye. As I was My little daughter Bernadette’s strong rock, I also will be your rock. The rock of Massabielle was a picture of Myself. I Am a firm rock and anyone who holds on to Me, all those who lean on Me will never tremble, will never falter, will never perish.